Dhanush is fresh from winning his first award for Maryan, at the recently held Behindwoods Gold Summit. His fans are meanwhile eagerly anticipating the release of Velai Illa Pattathari, the star's 25th film. Anirudh's music for the movie is already a big hit, and so is the teaser released some time back. 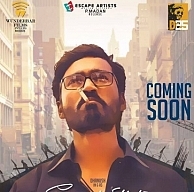 Dhanush tweeted about VIP yesterday night, along with a rocking new poster of the film. When we tried to find out when the movie is releasing, we got to know that the 3rd week of July (18th July Friday) is a feasible time for the movie to hit the screens. Escape Artists Motion Pictures would be releasing the movie, which has been funded by Dhanush himself. Velraj makes his debut as a director while Amala Paul shares the screen space with Dhanush. VIP may turn out to be her first release post-marriage. People looking for online information on D25, Velai Illa Pattadhari, Velai Illa Pattadhari release date, Velai Illa Pattathari, Velai Illa Pattathari release date, VIP, VIP release date will find this news story useful.